KLM’s Boeing 747 will be retiring after 50 years of loyal service. Fans of this magnificent machine have been awaiting the phase-out with a heavy heart for some time. I am also dreading the departure of the Grand Old Lady, which got me wondering why people develop such warm feelings for an aircraft. Is it the looks, the impressive dimensions? Is it the comfort or just nostalgia playing tricks? Renata Beck of KLM takes a little look back on the “Queen of the Skies” which has been the backbone of the KLM fleet for 50 years and the favourite of many cabin crew and passengers alike. The Boeing 747 is a firm favourite among cabin attendants. We love the broad aisles (where our Dutch hips don’t constantly brush the shoulders and knees of passengers), the spacious galleys (where we can stow everything easily on the big work surfaces and in logically designed cupboards) and the configuration, which was designed by someone who really had the interests of cabin crew at heart. 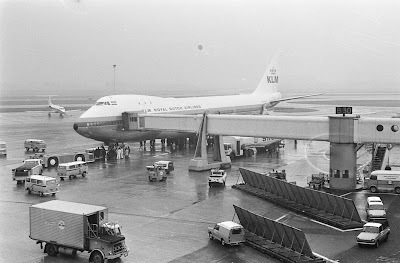 But nostalgia also plays a part, of course, mainly because many of us who have been with KLM for decades have always worked aboard the Boeing 747. And despite the arrival of new Airbusses, advanced Boeing 777s and modern Dreamliners, our Queen of the Skies remained firmly on her throne. The Queen has no Wi-Fi, atmospheric lighting or self-shading windows. But she has many loyal fans among cabin crew, myself included. It’s hard to explain the feeling, but our Queen is absolutely the most beautiful, the most charismatic, our first love and, quite simply, the one and only. It all begins when you arrive at the gate and see those impressive dimensions waiting for you, with its four huge engines and that hump, like awe-inspiring shoulders. This was the aircraft I drew as a child, with that characteristic hump, formed by the upper deck, accessible via a stairway. Over the years, I’ve encountered many passengers staring at those stairs, wondering where they led or asking if they could go up and take a look. Read more at Renata's KLM blog.